PLAN TO ATTEND THE 2014 TRIENNIAL INTERNATIONAL CONVENTION IN OCTOBER IN N. CHARLESTON, S.C.
Come join us for Pi Gamma Mu's triennial international convention in Charleston, S. C., on October 16-18, 2014, at the Crowne Plaza Charleston Airport - Convention Center in North Charleston. 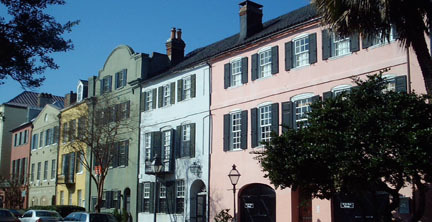 This charming southern city is one of the Top 10 tourist attractions as one of the oldest and most beautiful cities in the United States. The convention will allow you to meet members from other Pi Gamma Mu chapters and learn what they are doing at their schools, present a research paper from your social-science courses, and visit a variety of historic and interesting places in Charleston. You can tour a plantation, take a horse-and-carriage ride through downtown, visit the aquarium, take a ferry boat to Fort Sumter, or take a ghost tour of the area's haunted sites. Pi Gamma Mu student members may propose to present papers at the triennial international convention. Pi Gamma Mu will pay for one night's lodging at the Crowne Plaza Charleston Airport - Convention Center for up to 12 student members whose proposals are accepted and who present their papers as a formal 10- to 15-minute oral paper presentation at the international convention. Other student paper proposals will still be accepted but students will be invited to present their work in a poster session and not as a formal presentation. Regardless of the final presentation format, we are encouraging students to submit their work and look forward to learning about the research that Pi Gamma Mu members have completed. Each year, Pi Gamma Mu awards 11 scholarships to outstanding members. Five are named scholarships. Three scholarships are worth $2000 each, and the other eight are worth $1000 each. These scholarships are primarily intended for first-year graduate work in the social sciences. If you are interested in applying, you should start putting your information together right away. Applications must be fully completed and received at the Pi Gamma Mu office in Winfield, Kans., with a postmark on or before February 15. Winners will be notified in March, with the grants awarded in September. Please check the Pi Gamma Mu Web site for information and the application form. The URL address is www.pigammamu.org/scholarship_application.asp. Pi Gamma Mu's international Board of Trustees has appointed Dr. Suzanne Rupp to the position of international executive director, effective February 3. Dr. Rupp will take the place of Nancy T. Wiebe, whom the board had appointed in October to the position of executive director, effective January 1, but who reconsidered, citing her attachment to her current employer. The nominating committee invites all chapters to submit names of candidates for a position on the Board of Trustees to appear on the 2014 ballot. Chapter participation is essential because the Pi Gamma Mu constitution states, "Each candidate whose name appears on the ballot must be nominated by a chapter." Nominations for board members may be sent to Beth Biddle in the international office. All nominations are to be made generally for a seat on the Board of Trustees, without specification of a particular title. A chapter should not specify a position in its nomination. Positions to be filled for three-year terms are president, first and second vice presidents, secretary-treasurer, and chancellors for each of the regions. Dr. Orville D. Menard, who served as Pi Gamma Mu's 10th international president from 1990 to 1996, died at his Omaha, Neb., home on January 10. He was 80 years old. After earning a Ph.D. degree in political science at the University of Nebraska – Lincoln in 1964, Dr. Menard was a professor of political science at the University of Nebraska – Omaha for 34 years, until he retired in 1998. He became UNO's Pi Gamma Mu chapter sponsor in 1978, and remained in that position for 20 years until his retirement. The Nebraska Alpha Chapter was one of Pi Gamma Mu's most active chapters while he was its sponsor. President Barack Obama erred in not leaving a U. S. military presence in Iraq. Japan and South Korea are models for how the president should have orchestrated the thinning of U. S. troops. Al-Qaeda has re-emerged in Iraq alongside conflict between the Shiite government and Sunni rebel factions. Syria is still beset with civil-war-type conditions as President Bashar al-Assad fights rebel factions. Syrian rebel factions have been losing battles to al-Qaeda Jihadists in a conflict which started out as peaceful demonstrations in 2011. By now, 130,000 lives have been lost. President Obama has directed the sending of "non-lethal" aid to rebel factions and recently said that he is open to supporting an expanded Syrian rebel coalition. Mr. Obama's approach to the Syrian conflict has been rather cumbersome and ambiguous. The Pennsylvania Alpha Omicron Chapter at Washington & Jefferson College organized a social-science dinner together with the social-science club. They had a formal dinner and speakers from University of North Carolina – Greensboro and discussed a wide range of social and political topics. It was a huge success and they plan on making it an annual campus tradition. Dr. Yongsheng Wang is the chapter sponsor and chancellor of the Northeast Region. The Missouri Omicron Chapter at Evangel University had an exciting year. The chapter enjoyed several academic activities. It was involved in several events during the fall and spring. During Christian Citizenship Week, the chapter volunteered at a voter-registration booth. In the spring, the chapter held its annual Social Science Symposium. Four students presented a research project that they had previously conducted in an upper-level course. Dr. Luther Hall is the chapter sponsor. After I completed my undergraduate education at the University of Hartford, I spent six years working in the corporate sector. There, I discovered that I don't belong in the corporate sector. During my first couple of years as a corporate employee, I started work on an M.B.A. degree at the University of Connecticut, earning 18 credits at night. When my six-year corporate stint ran out, I decided to finish my M.B.A. degree. By then, I had less than an enthusiastic desire to be a corporate manager, so I selected a concentration in nonprofit institutional management. If you think that my theme in this essay is that the corporate sector breeds greed and corruption while the nonprofit sector facilitates the work of the angels, you have already jumped to the wrong conclusion. 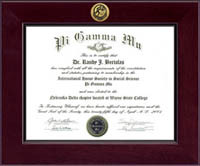 WAYNE STATE COLLEGE BECOMES FIRST PI GAMMA MU "STAR"
Congratulations to the Nebraska Delta Chapter at Wayne State College. It received the first "Pi Gamma Mu Star" plaque in the fall. The chapter sponsor, Dr. Randy Bertolas, uploaded the Pi Gamma Mu link, shown below, to the chapter's Web site. 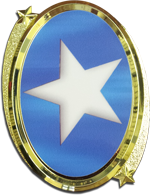 Would your chapter like to be a "Star"? Has Pi Gamma Mu helped you by giving you the recognition that you have earned as an honor student, or by facilitating your institution's process of recognizing honor students? If so, please help us to create new chapters so that faculty members and honor students at other colleges and universities can benefit, too. SHOW YOUR PI GAMMA MU SPIRIT! The international office is selling royal-blue Pi Gamma Mu sweatshirts in sizes M, L, XL, and XXL for $25. We have navy-blue polo shirts, embroidered with the Pi Gamma Mu key design in white, which are always a popular item. We have them in sizes M, L, XL, and XXL for $25. You can order your honor cords any time during the year. They can be worn at graduation, they can be draped around your Pi Gamma Mu membership certificate on the wall, or you can be creative--but be sure to order yours. There is an order form on the merchandise page at www.pigammamu.org/store.html. You can also call the international office and purchase these items with a credit card, and they will be mailed to you immediately. Church Hill Classics offers beautiful Pi Gamma Mu frames that can turn your membership certificate into a spectacular work of art! Visit the Web page at www.pigammamu.org/church-hill-classics-store.html. If you would like more items with the Pi Gamma Mu logo, check out the selection from our CafePress storefront. Pi Gamma Mu is one of 66 members of the Association of College Honor Societies (ACHS), which is the authority on standards and definitions for the honor society movement. 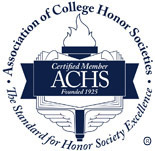 ACHS has stepped up efforts to alert the higher education community to the standards of traditional honor societies. In contrast, some new so-called honor societies exist online and allow self-nomination, accepting fees with no questions asked. If in doubt about an organization, you can check out the ACHS Web site (www.achsnatl.org) for the list of honor societies that are members. Pi Gamma Mu is a 501(c)(3) nonprofit corporation and able to accept tax-deductible donations. If you would like to make a donation to our organization in honor / memory of a professor, sponsor, loved one or friend, or to support our scholarship program, you are encouraged to do so. Pi Gamma Mu gives 11 scholarships to students going into a graduate program in social science each year. You can mail your donation to Pi Gamma Mu, 1001 Millington St., Suite B, Winfield, KS 67156. Pi Gamma Mu is committed to providing a wide range of services that will stimulate social-science research, recognize the achievements of honor students in the social sciences, and encourage student members to pursue graduate studies in social-science disciplines. We do a lot, and we'd like to do more! Please, would you help us? Donations of $25 or more will be acknowledged on Pi Gamma Mu's Web site and in the Pi Gamma Mu Newsletter. Pi Gamma Mu is a Section 501(c)(3) organization. Donations are tax-deductible in accordance with IRS regulations. Ask about the opportunity to endow a Pi Gamma Mu national scholarship. Here are ways to contact our international office.